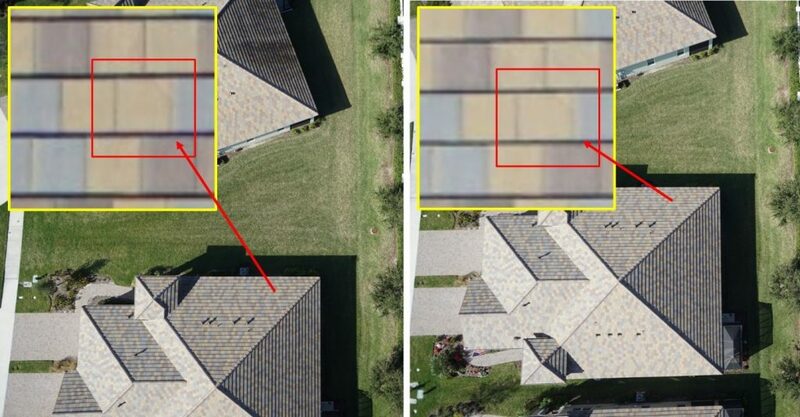 Drone based Roof Inspections with UNPLANNED outcomes! 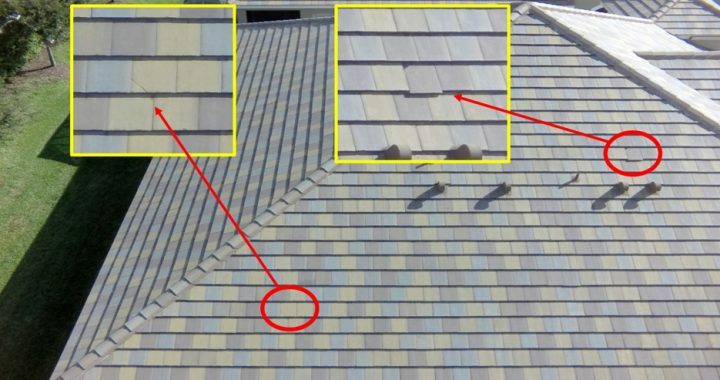 A short story of a roof inspection with UNPLANNED outcomes! 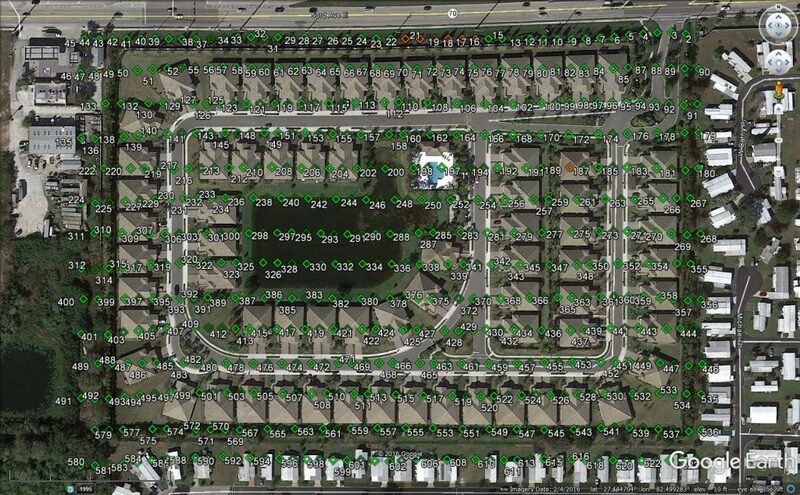 We recently were asked to do aerial inspections of the roofs of some 70 newly constructed houses. 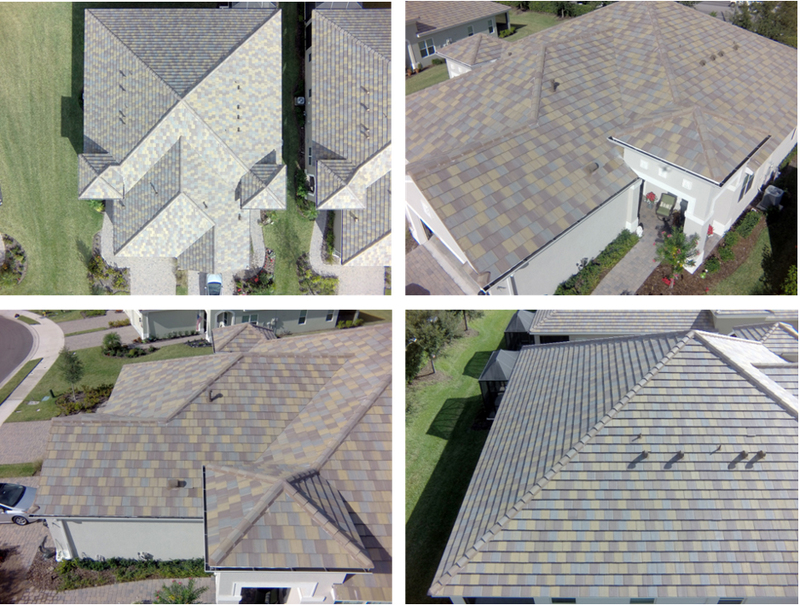 The client requested a complete visual light photographic coverage of each roof with sufficient resolution to detect cracked or slipped concrete tiles. 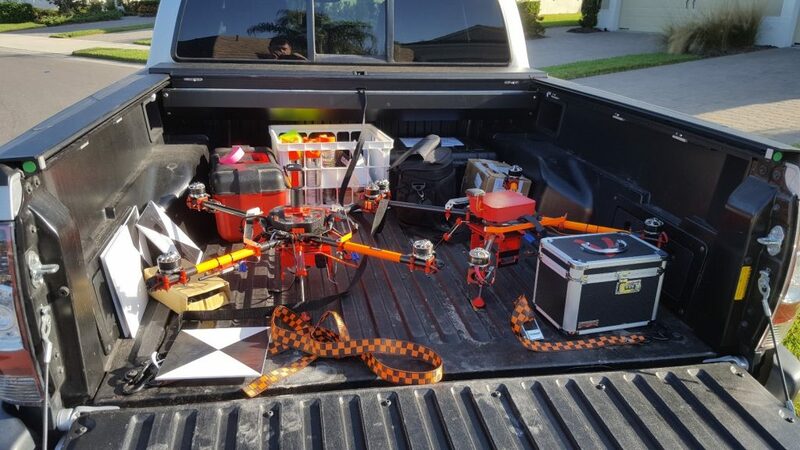 Here we share our experience on a drone based roof inspection project. Manually Composed Aerial Image Acquisition with First Person View (FPV) Facility. We went to the site with our Solo drone equipped with a GoPro Hero 3+ Black camera with a 5.4mm lens and diligently covered each roof by means of manually composing and capturing mainly oblique aerial images. We could complete the inspection of two houses per flight battery. After downloading the images, we bundled them into folders – one folder per house. Each image set had to contain one “index” image that clearly portrayed the house numbers which were displayed above the garage doors of the dwellings. This was the only identifier the client required in terms of “geo-referencing”. Figure 1 below is an example of an index image, which, when displayed on an average sized screen shows the dwelling numbers in legible size. Figure 1: The ‘Index” photo in which the presumably unique house numbers, displayed above the garage doors, are captured. 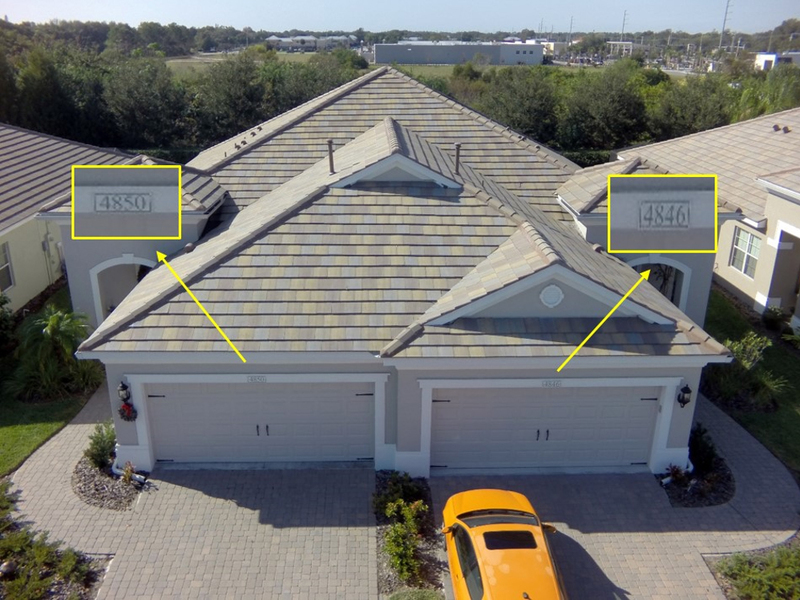 The individual roof inspection images were carefully composed by means of “first person view” (FPV) – a facility which presents the drone operator with a real-time view of the scene as it is being captured by the on-board camera. To ensure completeness, a methodical sequence was followed in a flight that generally went around the roof in a counter-clockwise fashion. It took us two days to complete the field work and to package the deliverables. On the morning of the third day we hand-delivered the product to our client whose offices were located nearby. 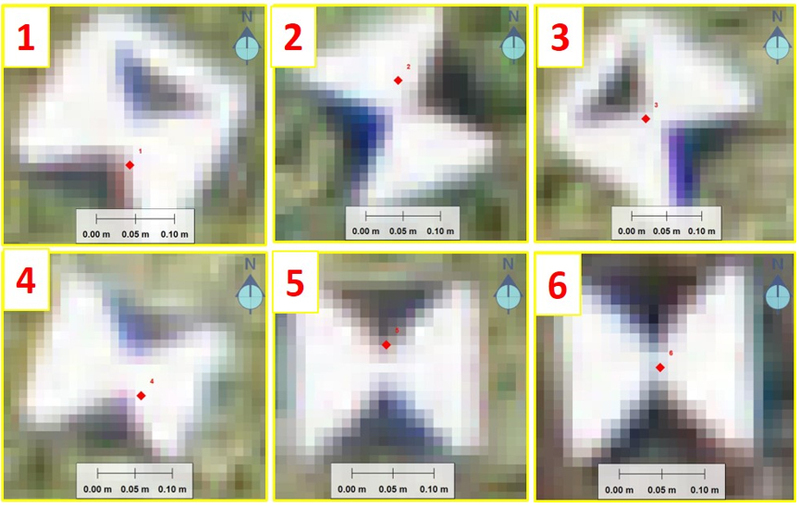 Figure 2 below shows a few examples of the vertical and oblique images we manually captured with our Solo drone. Figure 2: A selection of oblique and vertical images, all manually composed with the aid of first person viewing. Given the complex design and considerable height of the roof profiles – the highest point of the roof being some 8.5m (almost 28 usft) above ground level – the inspection by air certainly saved considerable costs in time and money, and generally reduced the risk of injury and the potential for disturbance to the occupants. The survey was done with the permission of the occupants, hence concern for privacy was in this case not an issue to be considered in our operation. 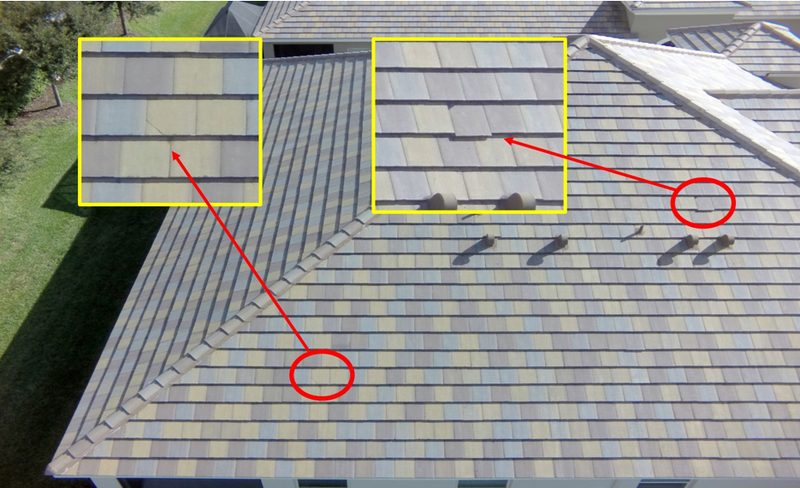 Figure 3: The most common defects, cracked and slipped tiles, identifiable in the oblique, manually composed aerial imagery. 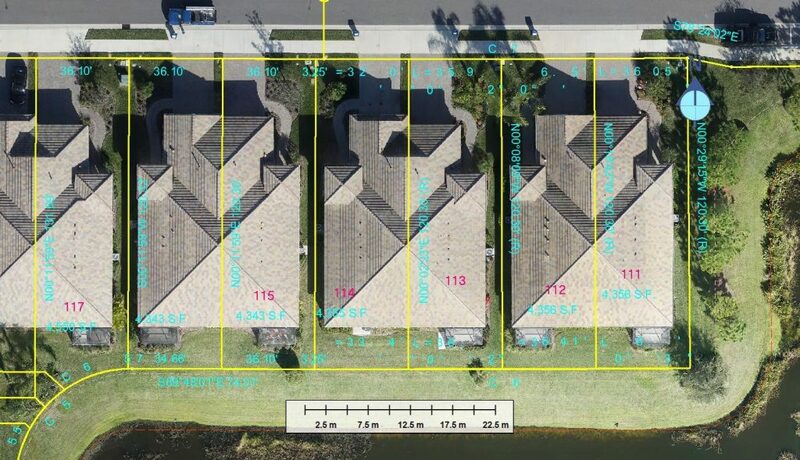 Notwithstanding our client’s satisfaction with the manually conducted aerial roof inspection, we decided to also use this opportunity to test an alternative approach by covering the entire subdivision – i.e. all 70 houses – with vertical imagery from which to produce geo-spatial products such as an ortho-photo and a digital surface model. Fully Automated Vertical Image Acquisition for Structure from Motion (SfM) modeling without Ground Control. 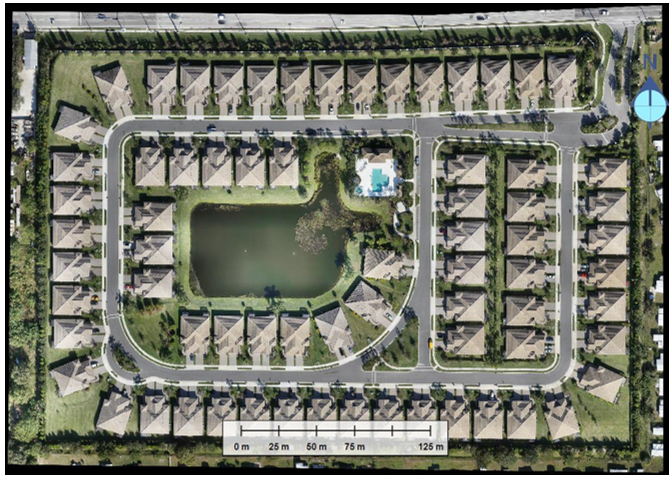 The SfM method of modeling the real world entails the use of overlapping aerial imagery (often also referred to as aerial stereo photography) and some means to geo-reference – i.e. place, scale and orient – the model correctly within a given spatial reference frame. To date the most common method of geo-referencing a model is the use of so-called Ground Control Points (GCPs). These are points which, through appropriate marking on the ground, are identifiable on the aerial images and whose spatial reference frame coordinates are known. 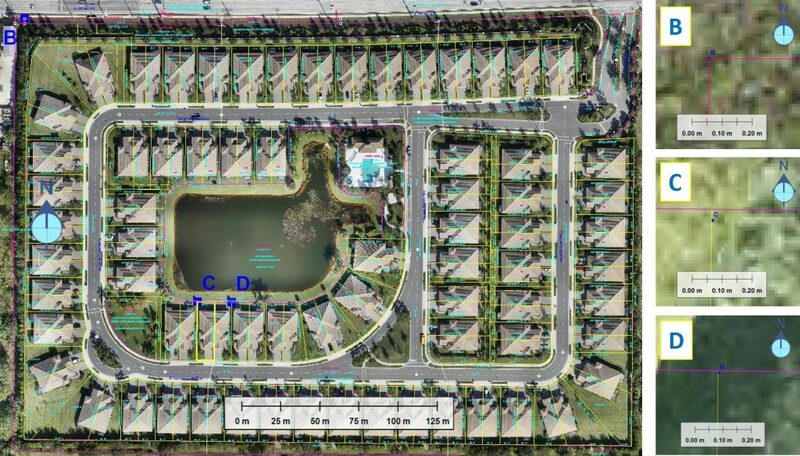 Typically, some six to twelve evenly spaced GCPs would be used to geo-reference a project of this size. An alternative approach to the task of geo-referencing entails the use of Camera Exposure Positions (CEPs) instead of GCPs. In this approach a carrier phase capable Global Navigation Satellite System (GNSS) receiver is connected to the airborne camera to determine accurate coordinates of the camera at the precise moment of exposure. Since our survey copter is equipped with the V-Map system from Micro Aerial Projects , we chose to follow the latter of the two methods of geo-referencing our map. Although not necessary, we decided to also add to our tasks the provision of six check points – points which for all practical purposes are GCP’s, but which instead for geo-referencing are used strictly for independent checking the accuracy of the model. You will notice that we are using the word “model” whereas you may quite rightly have expected us to talk about maps. 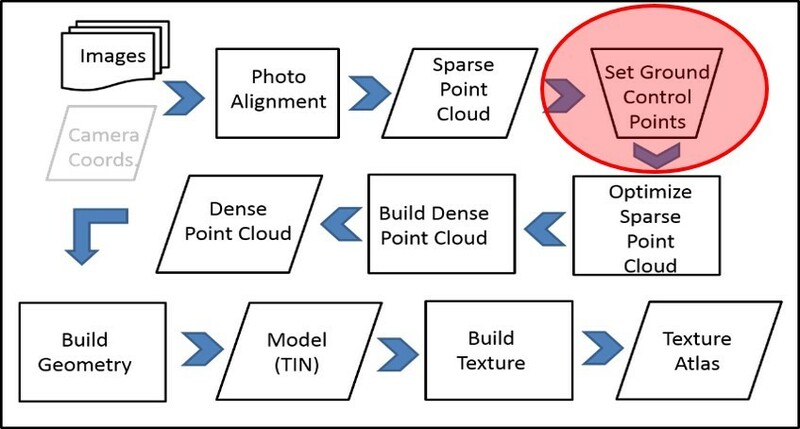 The reason for this vocabulary is to emphasize that the SfM process commences with the establishment of relative camera positions and a point cloud from which a three-dimensional digital surface model (DSM) is built. A digital ortho photo or SfM derived map, i.e. 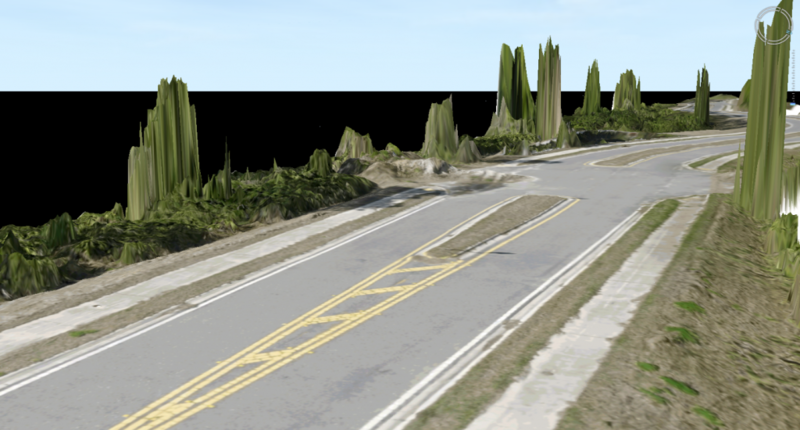 a flat visualization of the point cloud is just one of several geo-spatial products than can be derived from the model. Figure 4 below shows a typical SfM work flow in which use is made of GCPS. Setting ground control points, the step marked in red, is the only task in the work flow requiring manual inputs. From a practical and an operational point of view, the most significant difference between using CEPs and GCPs is that the former can eliminate or at least reduce the amount of manual labor required in SfM mapping. Provide an accurate set of SPC coordinates for spatial reference relative to the official state plane coordinate system. Provide reference station observations, which, in combination with the raw observations to be recorded by the roving, rod mounted V-Map receiver, would be used in a post processed kinematic (PPK) global navigation satellite system (GNSS) survey to determine accurate SPC coordinates in all terrestrial surveys on this project. 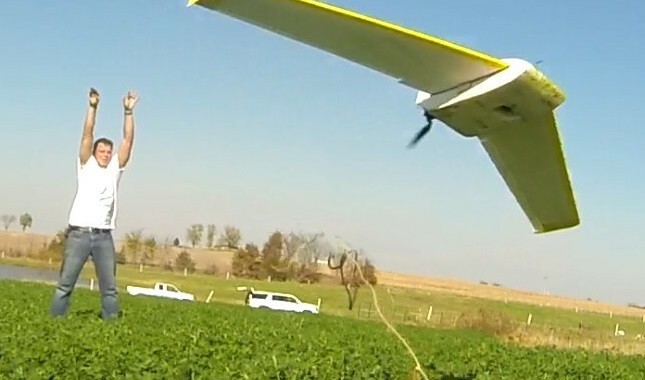 Provide reference station observations, which in combination with the raw observations recorded by the roving, drone mounted V-Map receiver, would be used in a post processed kinematic (PPK) global navigation satellite system (GNSS) survey to determine accurate SPC coordinates of each of the 622 camera exposure positions. Before starting with any field measurements, we powered on our reference station so that it could observe and record raw dual frequency GPS observations during all the subsequent ground and air survey activities. Figure 5 shows the V-Map receiver installed over our base point as GNSS reference station. To assess the geometric quality of our work, we set and surveyed six check points. For this purpose, we used the same V-Map receiver that would later be used on the drone to capture camera exposure positions in the air. Figure 6 shows how the light weight equipment can be transported from point to point and how points are demarcated and surveyed “on the fly”. 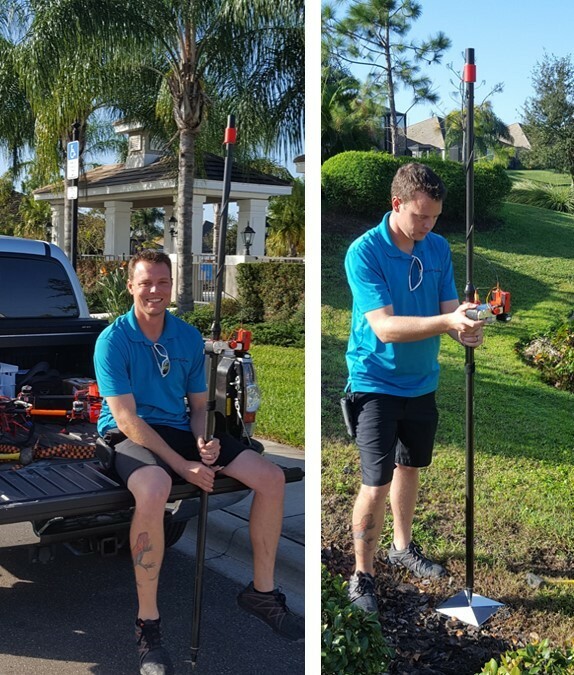 In this application of PPK GNSS surveying the surveyor simply places the rod on the 6d nail at the center of the target, centers the rod bubble and takes a picture. There is no need for any extended occupation time in this type of surveying. To provide for some level of redundancy that could alert us to incorrect occupation, whether by human error or as a result of a bad rod bubble adjustment, we surveyed each point twice – each time with a different orientation of the bubble relative to the point to be surveyed. The check point survey procedure took us in this case less than half an hour to complete. Note that the reference station was actively recording reference observations during the entire duration of the check point survey. On completion of the check point survey we powered down both reference station and rover and downloaded the raw observations of both from their respective SD cards. 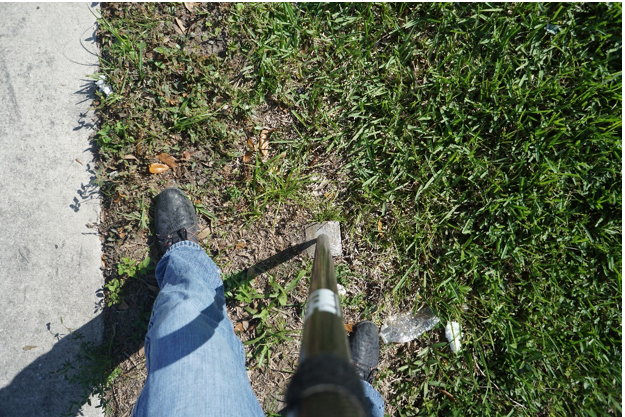 Figure 6: The V-Map receiver mounted on a standard survey rod for kinematic GNSS surveying of check points. Next we used the open source program Mission Planner to design a flight path for our survey copter for the automatic acquisition of 622 vertically aligned aerial images with a ground sampling distance (GSD) of 11mm, lateral overlap of 70% and forward overlap of 80%. To achieve these requirements with our Sony a6000 camera and 16mm fixed focal length, the flight altitude had to be 50m above ground level and the camera had to be triggered every 9.8 m. Figure 7 below shows our flight plan. After removing the roving V-Map receiver from the survey rod to the copter we could begin with the preparation of the automatic image acquisition flight by uploading the flight plan to the memory of the copter. Prior to launching our aerial image acquisition flight we powered on the reference station receiver and then we made sure that we were in full compliance with FAA regulations, that our flight plan was safe to execute (the power transmission line visible in Figure 8 below has a height of 30m) and that we had attended to each and every point on our check list. Figure 8 below shows our survey copter being launched on a fully automated image acquisition flight at 50m operational altitude. Figure 8: Our PPK GNSS V-Map equipped copter being launched on an automatic 25-minute, 50 meter altitude, image acquisition flight. Some 25 minutes later the copter landed in automatic mode. Now we downloaded the images on the SD card of the camera and the raw observations recorded on the SD cards of the reference station and air-borne V-Map rover respectively. Packing up the base station and drone equipment completed the entire field work component of this mapping exercise. Figure 9 below shows some of our standard selection of field equipment. It consists of three interchangeable V-Map receivers (one to serve as reference station, one to serve as drone or rod mounted rover and the third one as spare), two survey copters, check lists, critical air frame spares, drone repair tools, a small laptop (with a matt screen!) to interface with the flight controller, two fully assembled APM-controlled survey copters, flight batteries for six 30-minute flights, two Sony a6000 cameras with 16mm fixed focal length lenses, spare SD cards for V-Map equipment and cameras, survey rods, tripods, flight batteries, shovel, hammer and survey point demarcation materials such as rebar rods, nails, spray paint and GCP targets. We strictly follow the “one is none, two is one” rule for all airborne components. Figure 9: A view of the bed of our field crew vehicle. Table 1 below shows the time it took to complete the various field tasks. The last thing we did prior to departing the project site was to scan through the aerial images to make sure that their quality was acceptable. The first thing we did back in the office was to obtain precise SPC coordinates for our reference station. We converted the two V-Map reference station raw observation files (one created during the check point survey and the other during the aerial image acquisition flight) to receiver independent exchange (RINEX) format and uploaded them to the On-Line User Positioning Service (OPUS), a free service made available to the American public by the National Geodetic Service (NGS) of the National Oceanic and Atmospheric Administration (NOAA) of the United States. A few minutes after uploading the RINEX files, OPUS returned the reference station coordinates via e-mail. In addition to the coordinates, OPUS also reports the estimated errors. Table 2 below shows these estimated errors for each of the two sessions. A comparison of the two sets of coordinates, shown in Table 3 below, confirms that the estimates provided by OPUS are realistic. Since the differences are well within prescribed limits for general mapping work, we adopted the average of the two solutions provided by OPUS as the final SPC. Now that we had exact reference station coordinates we could start with the computation of the camera exposure positions. 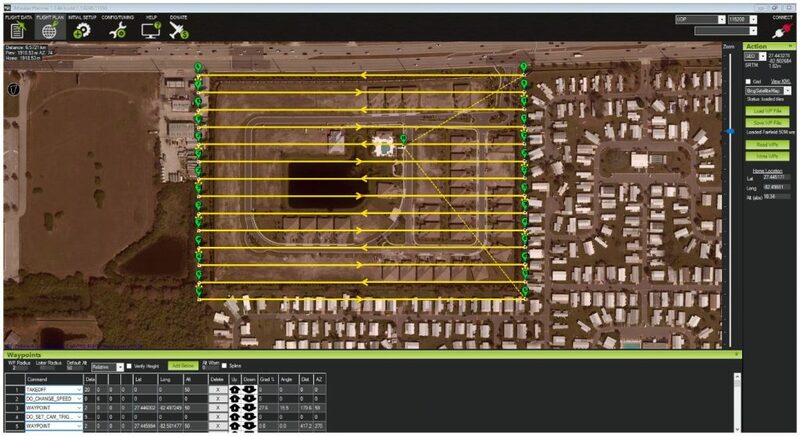 We used CamPos, a GNSS post processing workflow suite using components of the open source RTKLIB set of GNSS programs. The highly-automated process of computing camera exposure position coordinates with CamPos took some 10 minutes to complete. The final output from CamPos consists of a Google Earth compatible kml file displaying CEPs in color codes per GNSS solution type. Green symbols indicate optimum phase differential GNSS accuracy (i.e. integer ambiguities were fully resolved in the solution – so-called “fixed” solutions), orange symbols indicate so-called float solutions (integer ambiguities could not be fully resolved) and red symbols indicate autonomous “stand-alone” solutions. In addition to the kml file CamPos also produces a csv file containing the coordinates of CEPs together with accuracy attributes expressed in integers, the so-called Q-factor (Q for quality), ranging from 1 to 5; Q=1 indicating optimum accuracy based on a solution with fully resolved phase integer ambiguities, Q=2 indicating a float solution and Q=5 indicating an autonomous solution (i.e. the solution not differentially corrected with reference station observations at all). In our approach, we tag each CEP with a numerical value of the accuracy per Q factor. We assume an a-priori accuracy of 5cm for fixed solutions (Q=1). We attach a nominal a-priori accuracy of 10m for all other solutions (and we exclude these solutions from the constraint of any adjustments made to the camera alignment or point cloud). Table 4 below shows an extract of the CEP coordinate table which we use as input to the SfM process. 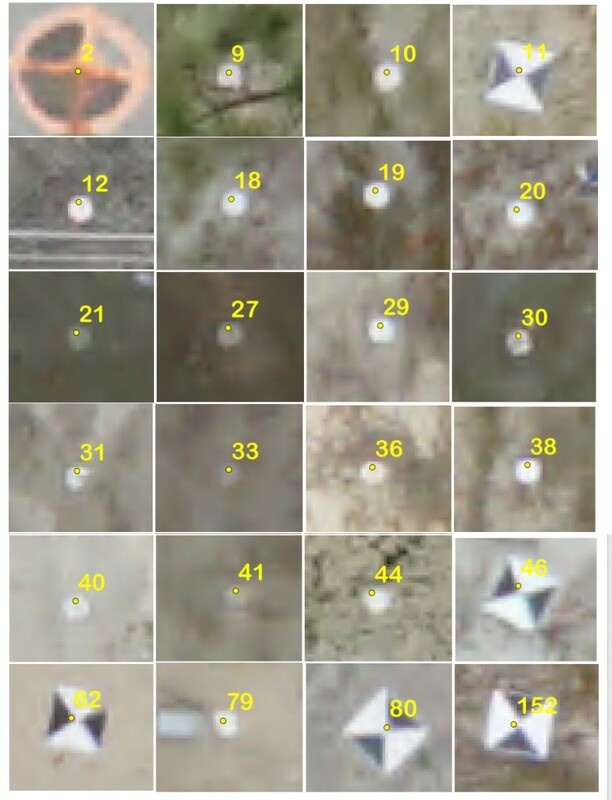 The Google Earth visualization of all 622 CEPs is shown in Figure 10 below. Note that seven of the CEP solutions turned out to be “float” and are thus shown in orange. Once we had computed the CEP coordinates we could proceed with the SfM workflow. For this we use a program from Agisoft called Photoscan Professional. After importing the 623 aerial images and the CEPs we performed a high accuracy camera alignment and investigated the degree of correspondence between SfM aligned positions and V-Map results. Figure 11 below illustrates the comparison. The correspondence between SfM camera alignment and the V-Map derived CEP coordinates turned out to be remarkably good, thus confirming that our a priori accuracy estimate of 5cm for fixed CEP coordinate solutions was not at all too optimistic. 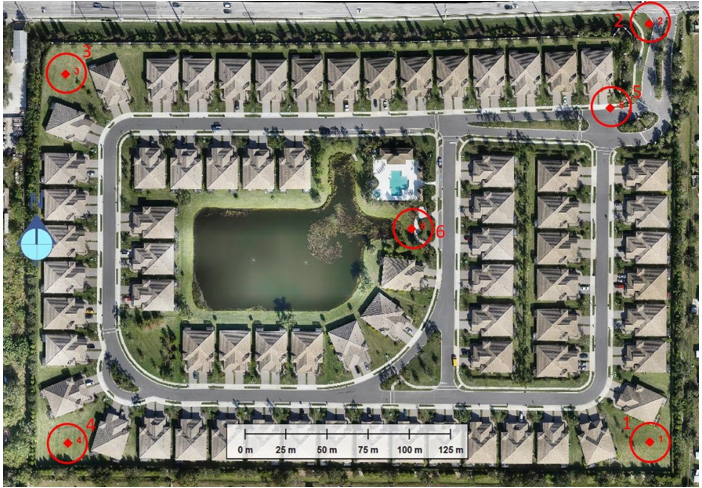 It is interesting to note that there is a concentration of the largest discrepancies right over the middle of the retention pond. This observation confirms that the high degree of accuracy in the V-Map derived CEP coordinates is sufficient to expose the weakness in the SfM camera alignment over areas which lack texture – such as water bodies! Once the SfM processing was completed we had to edit the point cloud by removing outliers resulting from the lack of texture over water surfaces. Next we exported from Photoscan Professional a digital ortho photo with GSD of 11mm and a DSM with cell size 22mmx22mm, both in geo-referenced TIFF formats. This process takes about half an hour. The ortho photo and DSM were them loaded into our GIS program, Global Mapper from Blue Marble Geographics. Since TIFF files are rather bulky, CAD and GIS programs tend to take rather long to render these types of files. Hence, we used Global Mapper to create an ortho photo in ecw format in which the data is more compressed and thus rendered significantly more quickly by programs such as Global Mapper. To make their appearance more pleasing and to exclude any regions where the SfM process failed to produce reliable results we also “trimmed” the ortho photo and DSM around the edges. Figure 12 below shows the entire ortho photo as displayed in Global Mapper. The first thing we wanted to find out was to see whether we could detect on our ortho photo the same defects that we could identify on the manually captured oblique GoPro photography. So we zoomed in on the same area of detail on the ortho photo as depicted on the oblique GoPro photo shown in Figure 3. The magnified section of the ortho photo is shown in Figure 13 below. Figure 13: Magnifying the Ortho Photo for detection of effects. Compare to Figure 3. The above figure shows that an ortho photo with a GSD of 11mm will be suitable for detection of slipped, but not of cracked, tiles. To improve the resolution for the detection of cracks, we would have had to reduce the flying altitude. Flying lower would decrease the image footprint and hence shorten the distance between successive exposures. Shortening the exposure distance interval shortens the time interval – thus increasing the rate at which the camera must expose and store images. To mitigate the possibility of missed exposures due to camera over-load, the flight plan can be changed to reduce the speed of the survey copter – thus increasing the time interval between successive exposures and giving the camera a chance to cope with the exposure rate. 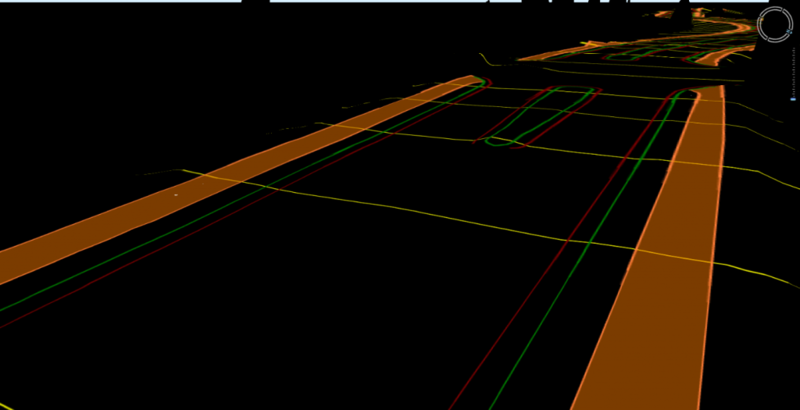 In addition to the insufficient resolution we notice that the shaded areas are too dark to inspect details in them. We have not yet taken the time to investigate whether selective manipulation of exposure values in the areas of interest on the ortho photo will render the dark shadow areas useful for inspection purposes. Another possible remedy to under-exposure is to fly under conditions of diffuse illumination, ideally created by, for example, high cirrus clouds. Furthermore, the vertical ortho projection prevents visibility of spaces obstructed by overhead features such as roof overhangs. Only full 3D visualization of elaborately constructed 3D models will facilitate the inspection of obstructed spaces – an effort which we could not accommodate in the scope of this project, but which we will be investigating at the next best opportunity. Having concluded that the ortho photo is inadequate for the detection of cracked tiles, we had a look at the images from which the ortho photo was made. On only two of the 13 images in which the cracked tile appears could we discern, not necessarily detect, never mind identify, the crack in the tile. These two images, shown in Figure 14 below, happen to be the ones closest to the zenith of the defect. 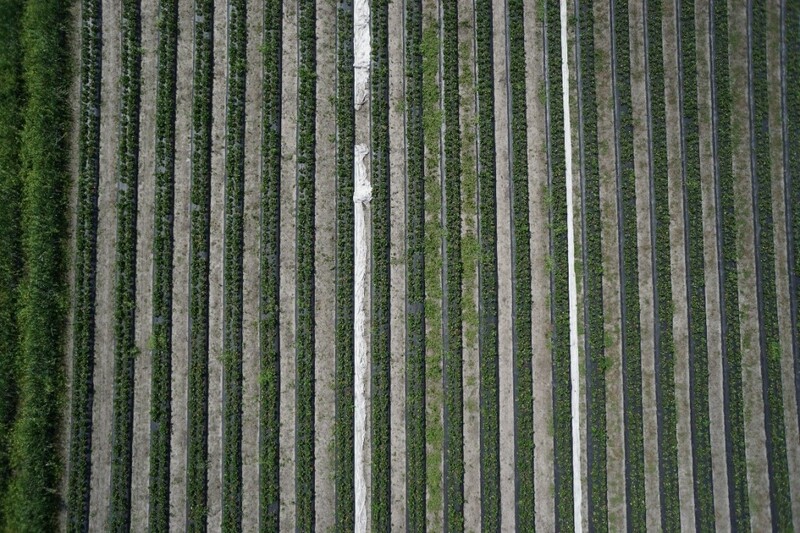 Figure 14: Appearance of cracked tile in vertical imagery as captured by Sony a6000 from a height of 50m above the ground. The next thing we wanted to establish was the accuracy of our map. Using the raw observations of our check point survey and CamPos, we computed coordinates for each of the two occupations of all the check points in our check point survey and compared the resulting pairs of the two independent occupations at each point to ascertain that no errors had occurred in centering the V-Map antenna over the point. The insignificant differences between the results of the independent occupations shown in Table 6 confirm that the V-Map observations yielded fully resolved integer phase ambiguities with correspondingly high accuracy and that the check points were accurately centered over during the independent occupations. Being suitably satisfied with the good agreements between the independent occupations we decided to compute and adopt the mean values as final coordinates of the check points. Figure 14 below shows the distribution of our check points. Figure 14: Spatial distribution of check points. Now that the check points were superimposed in a layer above our ortho photo and DSM, we zoomed in on each of the check points and captured the pre-marked target center coordinates (visible in the ortho photo) for comparison with the coordinates determined by terrestrial V-Map survey as described above. The numerical comparison between the two independently determined coordinates sets is shown in Table 7 below. 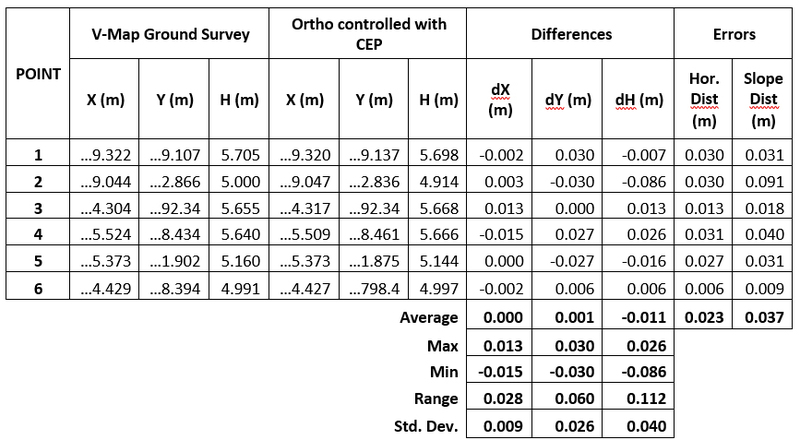 Table 3: Comparison between coordinates derived from terrestrial and aerial (ortho photo and DSM) surveys. Note that the two data sets – terrestrail survey and aerial survey – are, apart from being based on the same coordinates for the reference station, in all other respects completely independent of one another. Note also that in the comparison above there is one significant outlier, namely the elevation of check point 2. We suspect that this is as a result of the check point being located at the edge of the mapping area where image overlap is sparse. In fact check point 2 appears in only 8 aerial images while nearby check point 5 and check point 3, for example, appear in 14 aerial images. Removing this outlier would bring the standard deviation in the elevation from 4cm to 1.6cm. The lesson to be learnt from this is that one should always provide a generous margin of aerial stereo image cover around the area to be mapped. Ideally only areas which are covered by at least three strips of aerial imagery should be trusted for good mapping in all three dimensions. Figure 15 is another visualization of the horizontal errors at the six check points in our map. Note that the dimensions of the panels are 20cm x 20 cm (8” x 8”). Figure 15: Horizontal errors at the check points. Note the target panel has sides of 20cm (8″) length. Having established that our map is as accurate as can be expected from this type of mapping we were interested to see how well one could use the DSM on hard surfaces. Figure 16: Photographic record of monument being surveyed with a rod-mounted V-Map receiver. Having performed an internal quality check on our map we decided to use third party data for an even more independent verification of our mapping accuracy. Our client was kind enough to furnish us with a digital copy of the licensed land surveyor’s plat of the subdivision in dwg format. When we imported the plat to Global Mapper we noticed that there was a systematic shift between the parcel corners as depicted on the plat and where one would expect them to be on the ortho photo. 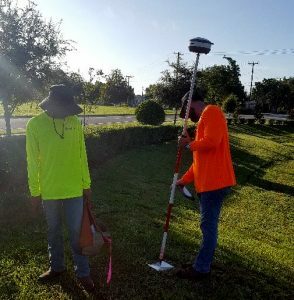 Since land survey regulations in the state of Florida still do not prescribe that cadastral surveys have to be referenced to an official datum and coordinate system, we concluded that the plat was referenced to what practicing land surveyors in the state of Florida often refer to as a “pseudo state plane” coordinate system. Because the digital plat did not come with any geo-referencing meta data, we went back to the site, located three monuments that appeared on the plat and used our V-Map receivers to obtain official state plane coordinates for them. From this information we could calculate that a shift of 38.7cm (1.27’) in a direction of 69.5391° would significantly improve the agreement between the plat and our ortho photo. Figure 16 shows a photograph that was taken at the moment that one of the monuments was surveyed with the V-Map receiver mounted on the survey rod. This photograph is an objective and unimpeachable record of the feature that was surveyed and in many ways, improves on the conventional written notes and hand-drawn sketches required in terms of current practice. The resolution is actually sharp enough to interpret the lettering stamped into the disc embedded in the concrete monument. In Figure 17 we show the plat (i.e. the parcel boundaries) after application of the systematic shift overlaid on the ortho photo. The comparative insets show how well the V-Map survey results compare with the plat, thus confirming that the application of the shift properly referenced the plat to the same reference frame as the ortho photo. Now that we had transformed the plat from a local reference frame to the official state plane coordinate system we could begin comparing the plat with physical features shown on the ortho photo. 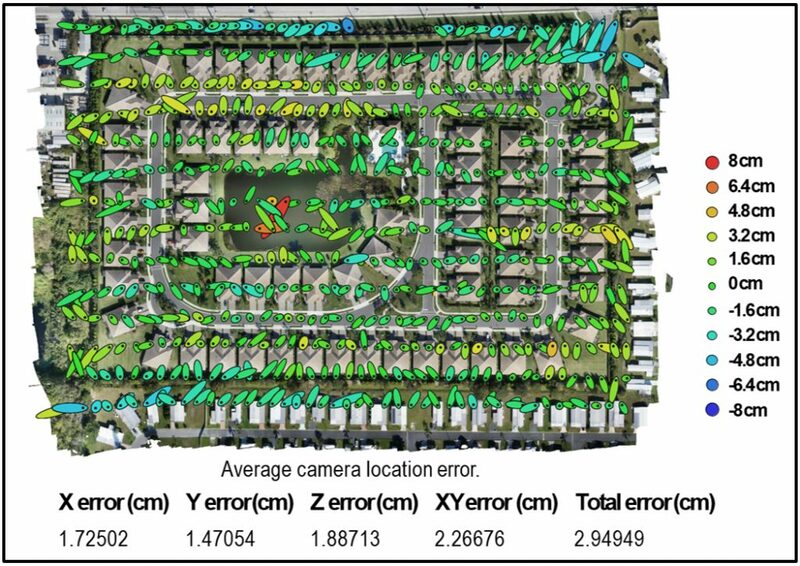 Figure 18 shows a region where we detected a consistent east west discrepancy between boundaries and roof tops of 40cm (1.31’) which is significant in terms of cadastral surveying accuracy. Is this discrepancy a result of errors in the original plat survey or in the setting out of the foundations? One way to find out would be to search and pre-mark the boundary monuments and then to re-map the area. Alternatively, the more arduous conventional approach of searching and surveying the monuments as well as the houses accurately on the state plane coordinate system could be followed. Figure 19: East-West discrepancy of some 40cm between roof-tops and plat. Figure 19 is an extract of a region in the south-east of the ortho photo where the roof tops seem to align perfectly with the plat lines. However there seems to be an asymmetric placement of the block relative to the street alignments – also in the east-west direction. Are the discrepancies, uncovered her by SfM surveying, perhaps due to a change in spatial reference between original platting and setting out of streets and parcel corners? To get to the bottom of the discrepancies displayed here between plat and ortho photo would require the survey of a larger number of corner monuments and other, well defined features. However, considering that apart from setting up and powering on the reference receiver, the ortho photo was produced with virtually no conventional survey work on the ground – the agreement between it and the cadastral survey is truly remarkable. Fully appreciating the powerful role played by the Structure from Motion (SfM) technique in the mapping revolution, we understand that embedded in the fiber of an SfM produced map are some very important quality characteristics which, when not specifically disclosed and effectively displayed, will remain hidden to the user of the map. These characteristics can be understood as the quality DNA of the individual map. A responsible map maker should thus proactively determine and display this DNA for each of the maps he or she makes, thereby providing the individual map with an authentic certification that is much more relevant and meaningful than the credentials of the map maker himself. One way to display horizontal errors is to plot them at a much larger scale than the map itself, as shown in the figure below. The advantage of this type of error visualization is that it would very efficiently expose bias in position or rotation across the mapping domain. The disadvantage is that it is not all that easy to visualize the magnitudes of the errors. So we are looking for effective ways to attach a clear picture of the true DNA to each of the maps we make. In the figure below there is another example of error reporting that may communicate better than numerical tables of errors or statements regarding the “class of accuracy” as defined by some or other organization. 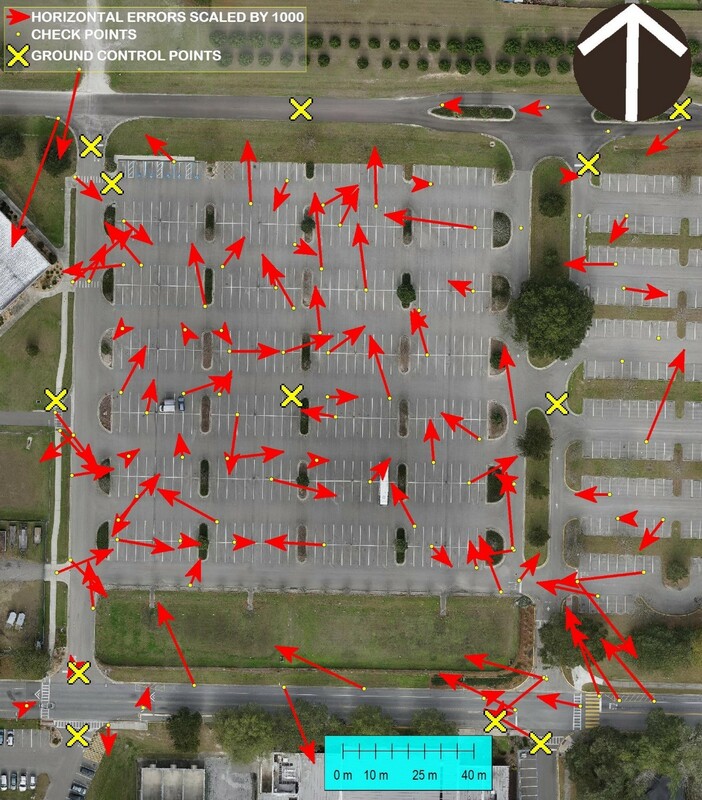 Here we show the “true” location of check points – determined to 10mm accuracy by total station – superimposed as yellow dots over the corresponding targets in the Ortho Photo. The distance between dot and target center represents the local horizontal mapping error. For a realistic understanding of the significance of these errors all the reader has to know is that the square targets have dimensions 20cm x 20cm and that the round white targets have a radius of 5cm. Aren’t these “error-pictures” much more realistic and relevant than all the other ancillary, albeit interesting information such as the flying height of 50m, the wind speed of 5m/s, the GSD of 13mm, the MAP-M4 multirotor platform, the airframe mounted Sony a6000 camera with 14mm lens that was connected to a dual frequency on board V-Map GNSS receiver weighing only 130g (www.v-map.net), the average estimated 3D camera position accuracy of 3cm and the combined number of more than 50 man-years of experience in mapping under the belt of the map makers? Oh, and never mind the fact that no Ground Control Points were used to make this map! 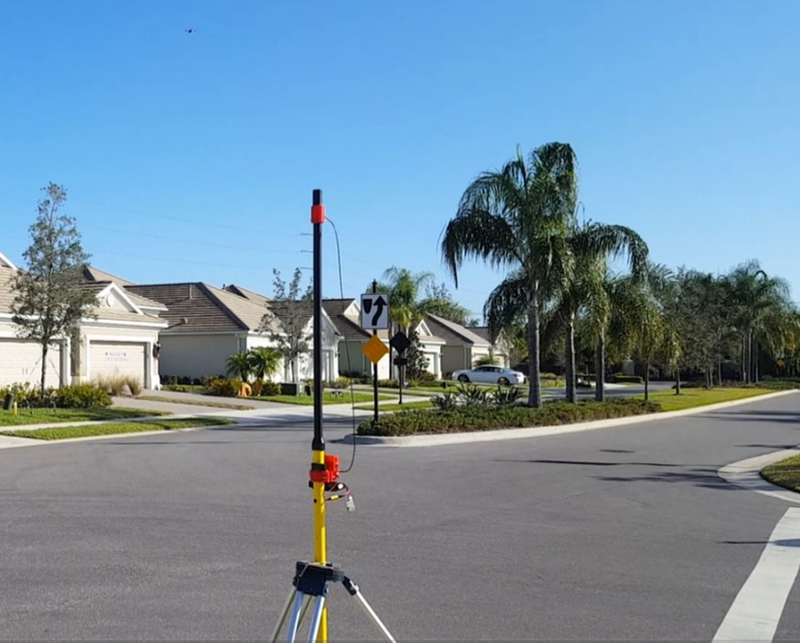 When it comes to surveying a busy intersection, responsible surveyors think of accuracy, completeness and safety. The first two considerations, important as they are, are often the easy ones. Safety of your crews however, the primary concern, is always a challenge in conventional surveying. Apart from having to make time consuming and annoying arrangements for disruptive traffic management, Total Station and GNSS methods require that crews operate in dangerous places for extended periods of time. 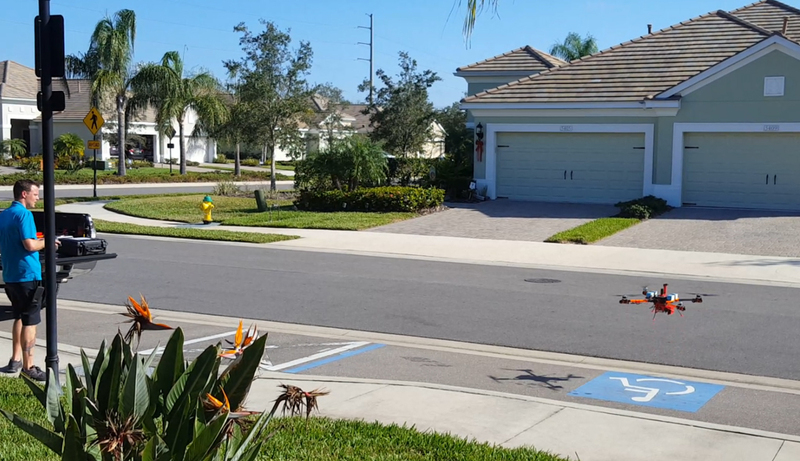 BRING IN A SURVEY DRONE! With a survey drone and appropriate geo-spatial expertise, you can get the job done without exposure of crews to dangerous motor traffic! Survey ground control points in places that are out of harm’s way, acquire aerial imagery and do the rest in the safety and comfort of your office! Reduce your field presence by as much as 95% and yet come home with a complete field book. 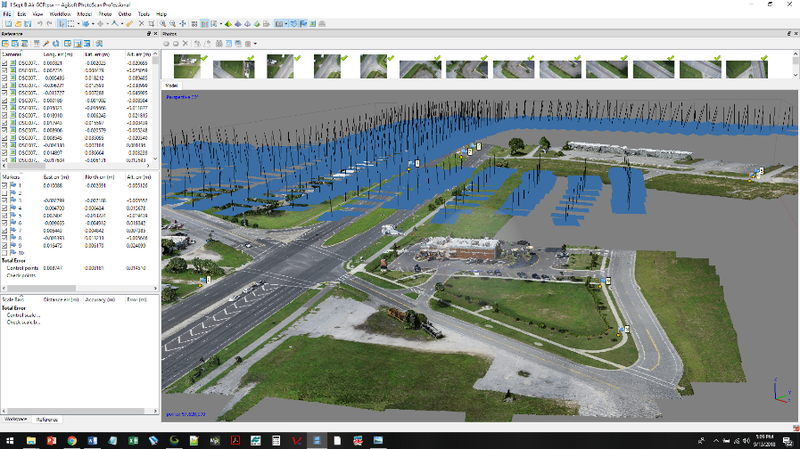 Photoscan Professional, the leading Structure from Motion suite, is the tool to build point cloud, surface model and ortho-photo from the aerial images. We use Global Mapper to analyze terrain, vectorize features of interest and format and package the geo-spatial deliverables. drone2GIS Inc. offers a full geo-spatial service from Aerial Image Acquisition with small drones to specialized analysis and visualization of the high precision, ultra-realistic models we create of service corridors in the oil and gas industry. Never mind how difficult the terrain and field conditions, contact us for the safest and most efficient path to actionable information about your assets. Supported by our very own V-Map methodology we add precision and reliability to safety and efficiency. We bring reality from the harshest environments to the comforts of your desk, putting you fully in the picture as if you were “at the scene”. Welcome on board and enjoy this short inspection flight. We are always glad to take on opportunities for the promotion of small drone mapping. What better way to do that than by helping with training and education of progressively thinking young land surveyors and mappers? 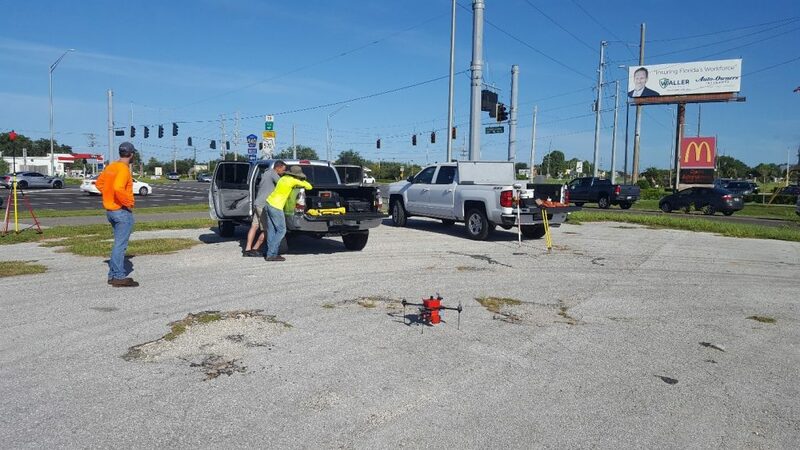 When the Department of Geomatics of the University of Florida recently approached us for assistance in the teaching of their certificate course on UAV mapping, we volunteered to demonstrate our automated image acquisition procedure. 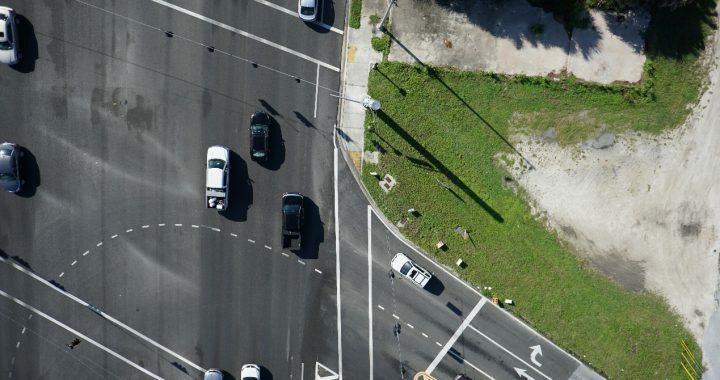 We realize that a lot still has to be done to convince sceptic professionals that small drone mapping is a robust, reliable, accurate and extremely efficient approach to bring just-in-time actionable geo-spatial information to the desks of decision makers such as engineers, environmentalists and farmers. Getting approval to conduct the flights over a suitable site on University property proved to be a frustrating exercise. So we decided to turn to the private sector for a more practical and timely solution and promptly received spontaneous approval from Mr. and Mrs. Larry Rogers, the owners of Rogers Farm. They kindly allowed us to conduct the field exercise on and over their land some 10 miles out of town. 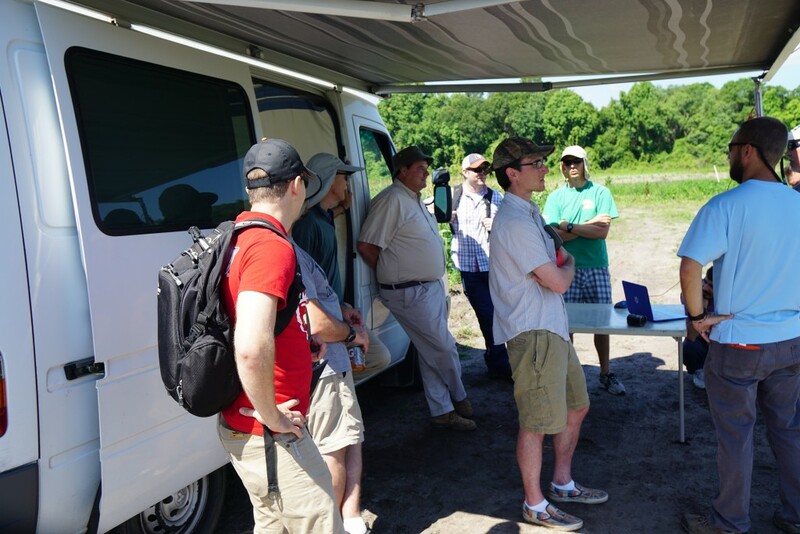 Mr. Larry Rogers of Rogers Farm and Oliver Volkmann of drone2GIS Inc.
For this exercise it was decided to use ground control points (GCPs) for accurate geo-referencing of the models and maps produced from aerial images using the professional version of the Structure from Motion (SfM) Photoscan program. The images were acquired with our customized mapping copter, the MAP-M4, designed, assembled, configured and tuned by our sister company Micro Aerial Projects L.L.C. (www.microaerialprojects.com). The students used a copy of the aerial images to produce project posters illustrating various facets of high resolution drone mapping. 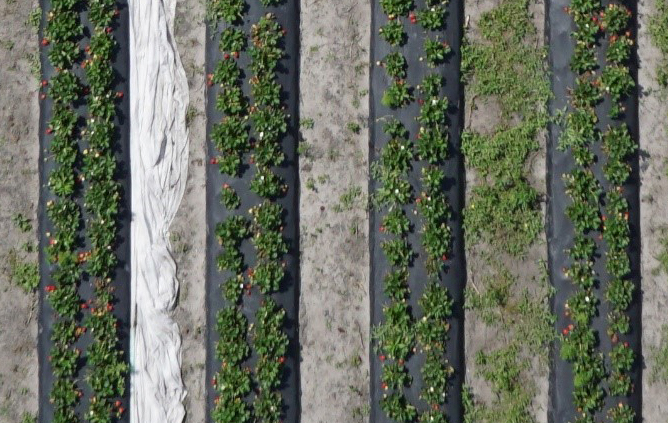 We ourselves will be using these high resolution images to investigate the use of the imagery to estimate strawberry yields. To return the favor of letting us fly over their property we produced a 3D model of a corn field maze which Rogers Farm annually prepares for their Octoberfest each year. So please do not be tempted to do the maze virtually – rather consult http://rogersfarm.webplus.net/page10.html and get some fresh air by visiting Rogers Farm during their Octoberfest from October 3rd through November 1st 2015. 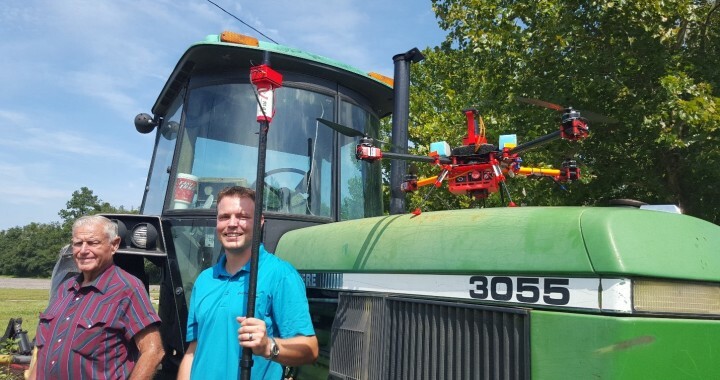 The small drone mapping revolution rolls on! The small drone mapping revolution rolls on! 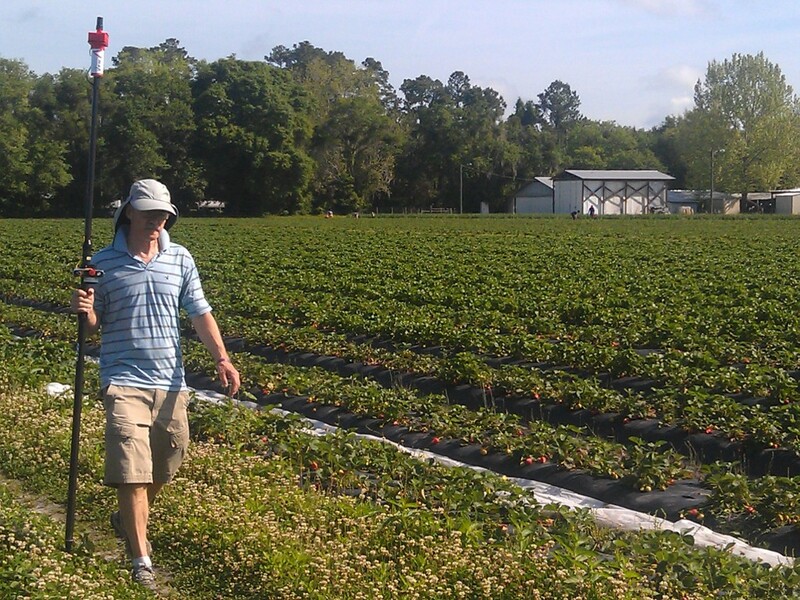 At drone2GIS Inc. we realize that our success depends on operational safety, efficiency and product quality. So behind the scenes you will find us time and again going back to our test bed for accuracy tests. That’s just part of an innovative surveying and mapping operation. Here you can see Oliver operating our MAP M4 system, equipped with V-Map for accurate camera exposure positioning, capturing yet more gigabytes of data for map quality validations. The Mapping Revolution – Bringing the real world, to your desk! 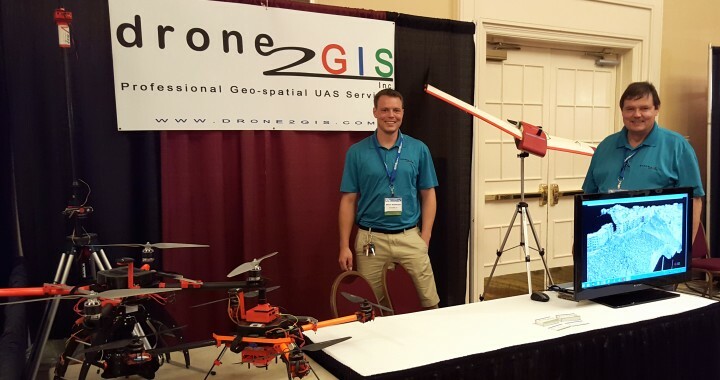 drone2GIS Inc. is currently at the 60th Annual General Meeting of the Florida Surveying and Mapping Society (FSMS) in Naples Florida showcasing the revolutionary mapping capabilities of small unmanned aerial systems (drones) and Structure from Motion (SfM) processing software. 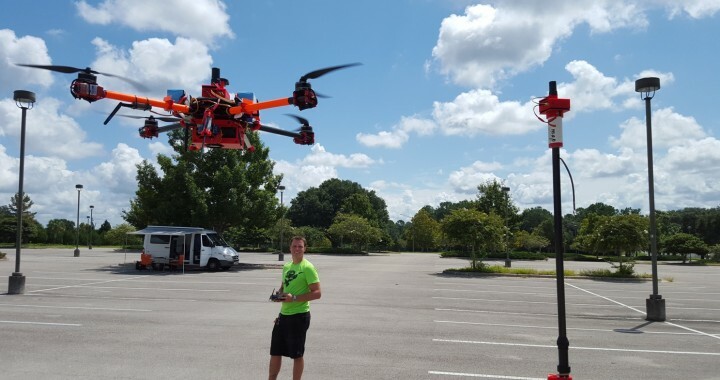 With over 63 combined years of experience in general surveying, mapping and GIS as well as a combined 10 years of experience using UAVs for mapping, drone2GIS is your choice for high quality geospatial products. For more videos, please visit our YouTube Channel! Affordable tools (drones, off the shelf high resolution cameras and structure from motion (SfM) software) are now lined up for efficient production of high quality BIG data – aerial images, point clouds and surface models can be delivered in very short times. But they constitute big, suffocating data for most standard engineering design applications such as CAD. The challenge is to efficiently extract the essentials from big data so that the engineers can get on with their work. Figure 1 below shows an ortho photo of approximately 1700 foot of roadway, on average about 60 foot wide. This ortho photo was produced with Agisoft Photoscan Professional (an affordable Structure from Motion software package) from 382 aerial images collectively taking up about 3.7GB of disk space. Point cloud, surface geometry and texture together make up an additional 2.8GB. The Ortho Photo with GSD 0f 0.04’ in geotiff format occupies 127MB while the digital surface model, also in geotiff format, with 0.08’ grid size takes up 265MB. All of the 6.5GB of data was rolled out in a matter of less than 24 hours. But in this form the data is too big for practical use in most standard CAD packages. 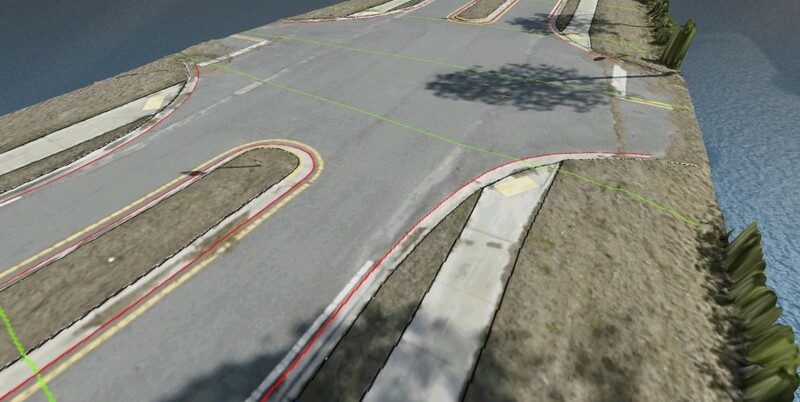 Figure 2 below represents an oblique big data view of a section of the road. Figure 3 shows the same view with features of interest vectorized and tightly draped over the 3D terrain. 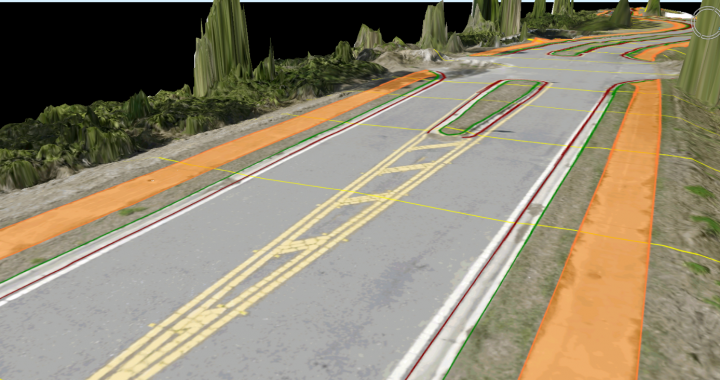 Figure 3: Common road geometry features vectorized and superimposed “snugly” on the big data surface model. 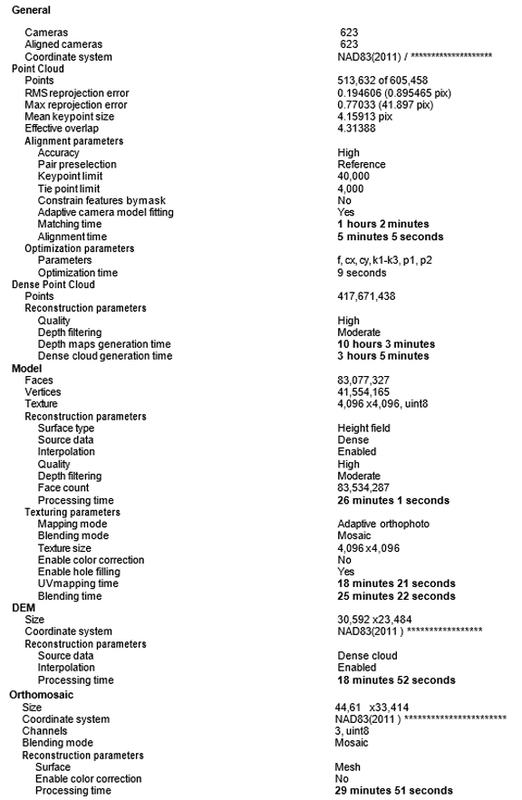 Figure 4, shows the ESSENTIAL data that was extracted from BIG data using Virtual Survey Tools. 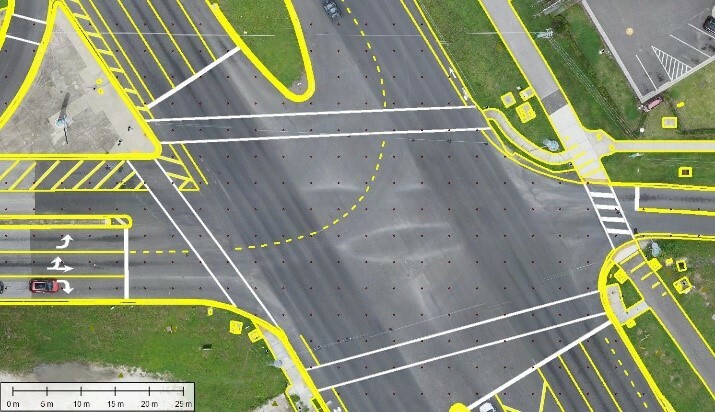 Figure 5 below shows typical geometry features needed for road design work. Conventionally these features are surveyed either by terrestrial LIDAR or by real time kinematic (RTK) global navigation satellite system (GNSS) methods, both of which take substantially longer periods of time in field data acquisition and both of which require boots on the ground in the right of way for extended periods of time. Using small drones and off the shelf cameras the data acquisition effort, including ground control survey, is drastically reduced to about an hour on site, thus not only saving significant costs but also improving the safety of the survey crew. 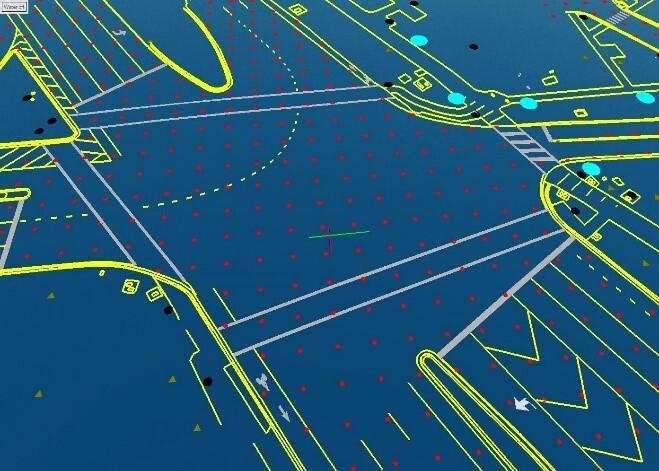 Using Virtual Survey Tools the features shown in Figure 5 were vectorized and exported to shp and dxf formats in approximately 8hrs – all in the comfort and safety of the office environment. 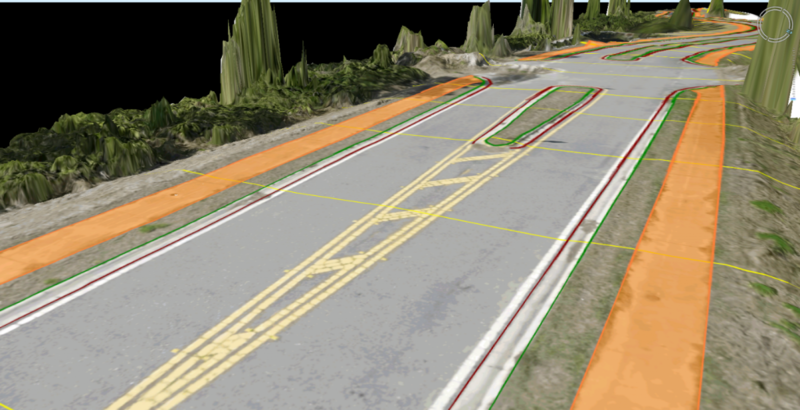 Figure 5: Typical road geometry features superimposed on high resolution ortho-photo. The features depicted in Figure 5, when delivered in both dwg and shp formats together make up about 45MB of data. The table below shows the relative storage requirements for the products resulting from a typical SfM work flow. 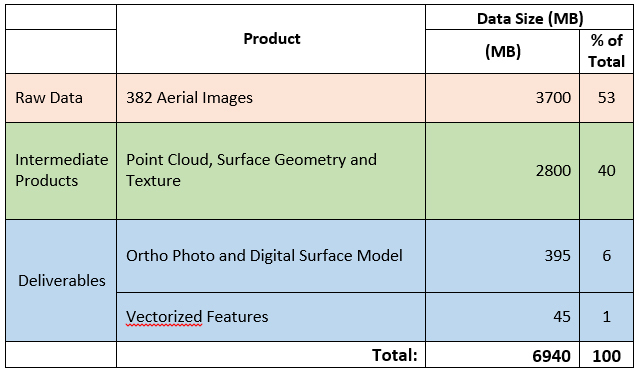 Figure 6: Relative Storage Space required for geo-spatial products generated in SfM workflow and subsequent feature extraction with Virtual Survey Methods. And what about accuracy? 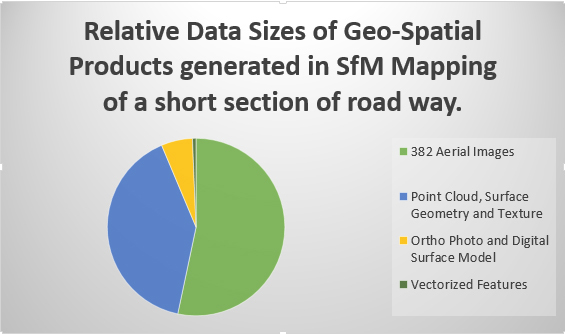 Table 2 below shows a comparison of the coordinates derived from the SfM survey of 31 targeted check points with geodetic class GPS results. 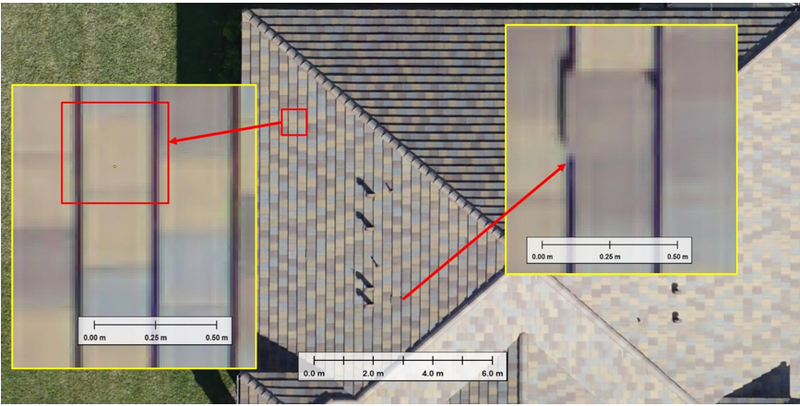 Utilizing appropriate visualization and virtual survey tools, the high resolution of the original imagery facilitates precise capturing of geometric features such as shown in Figure 7 below. 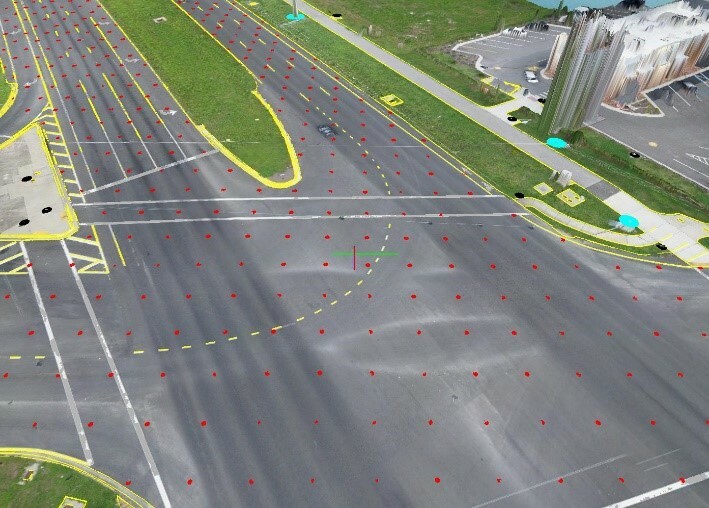 Small drones, off the shelf cameras, structure from motion (SfM) software and virtual surveying are the new tools for accurate and safe road surveying. 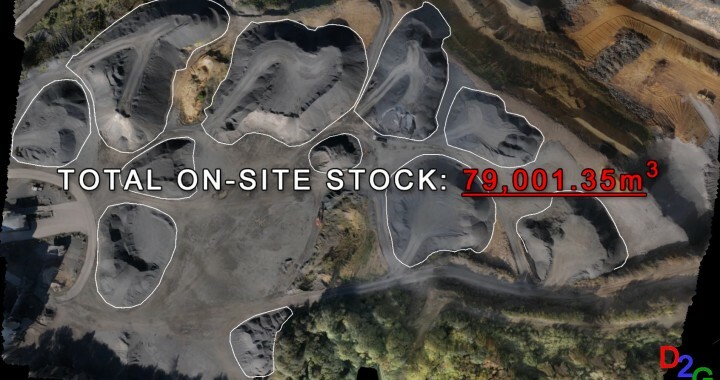 Drone2GIS offers a safe, efficient and accurate alternative approach to the conventional surveying method employed in open cast mines, quarries and stock yards for data acquisition. Through the employment of Unmanned Aerial Systems, Drone2GIS delivers precise, high accuracy ortho-photos, digital terrain models and virtual realities. With these products, we can extract features and positions to produce the same products one would expect from a conventional survey without the safety risks of having boots on the ground. Data can be captured as and when needed without significant impact on the day to day operation of the site and at a fraction of the time it would otherwise take. Take stock of your inventory with accurate volume measurements, visualize your site without the stock piles, and get the data you need when you need it with minimal impact on production! Surveying in an opencast mine, quarry or a stock yard has challenges. Setting up terrestrial scanners and other survey devices in the traffic of heavy equipment either slows down production or poses serious safety risks to the survey crews. Other safety and health risks involve steep ledges, potential for rock/land slides, noise and dust. Conventional surveying takes time, involves more than one person and can be very expensive. In addition to the safety concerns, logistics can also become difficult as parts of the location may need to be shut down while the survey takes place. Our approach saves time and money while ensuring a safer operation without boots on the ground. 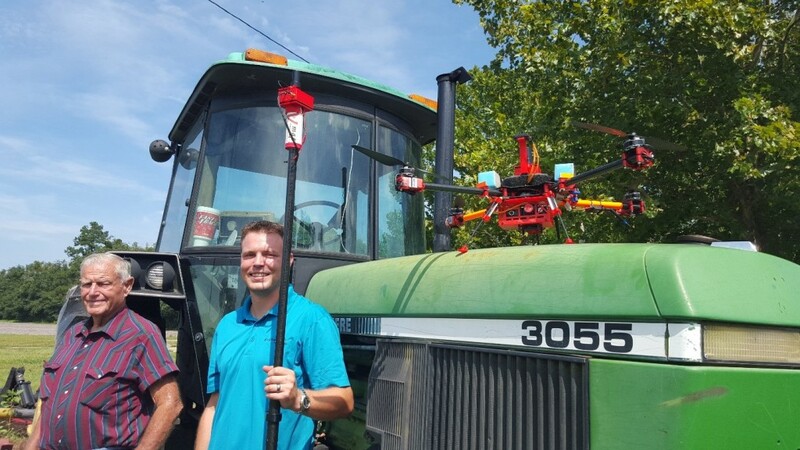 Contact us at info@drone2GIS.com for more information on how we can help increase the safety, efficiency and profitability of your operation! 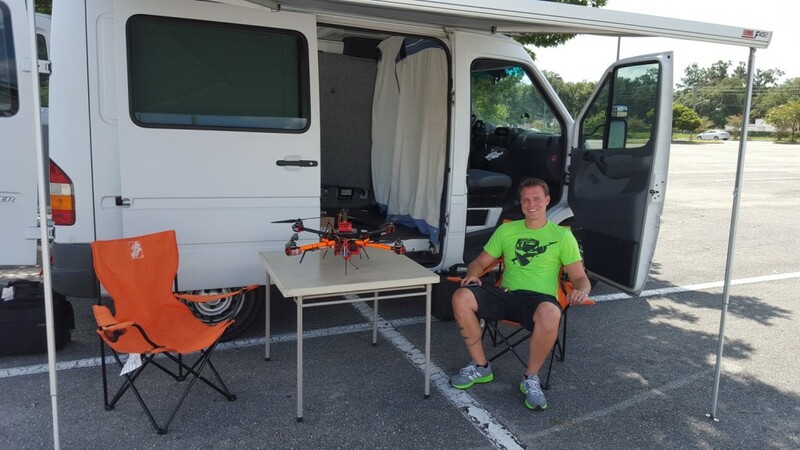 drone2GIS, More than just Maps! Welcome to the new geospatial company on the block! Our experienced and highly qualified team is ready to bring you new and modern geospatial products. 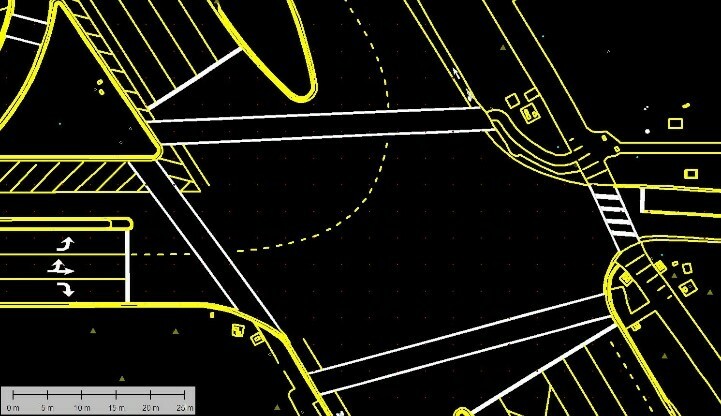 So whether you are a farmer, an earthworks contractor, a construction company, a mining operation, a utility company, a landscape or urban planner, an urban designer, a land developer, an architect, a civil or environmental engineer, a geologist, a forester, or an academic, contact us for your geospatial requirements. Drone2GIS, when it has to be more than just maps!